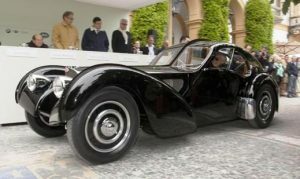 Cuando hablamos de carrocerías tipo Fast Back (cola rápida) nuestra imaginación se va al popular Mustang y seguramente, si pensamos en años anteriores, podemos destacar a las carrocerías del tipo Sedanette de la GM. Igualmente son formas de un proletariado, que nada tuvo que ver con su antecedente europeo y su nombre mas artístico de carrocería ” Gota de Agua”. Francesa por supuesto. 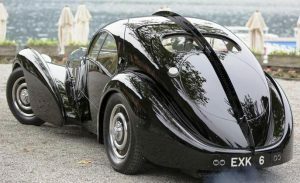 Entre sus destacables representantes se encuentra la Bugatti Tipo 57 S Atlantic, la cual se basó en la Coupe Aerolithe Elektron, un auto de exposición construido para el salón de París de 1935, el cual como estaba construido con paneles de elektron (combinación de magnesio y aluminio) se volvía muy difícil para soldar. 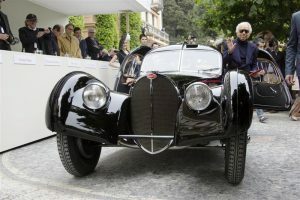 Fue así que Ettore Bugatti usó, para llevar a cabo el diseño de su hijo Jean, los característicos filones ribeteados, que unían la carrocería en dos mitades, ya que dicha unión se debía hacer de forma externa. Si bien las otras tres unidades se construyeron en aluminio, esos filones ribeteados se conservaron ya que le dieron su característica forma que la hizo famosa. De este modelo se construyeron 4 unidades dotadas de un motor de 8 cilindros en linea de doble árbol de levas a la cabeza, 210 CV y 3,3 litros logrando hacer circular los 960 Kg. de peso del vehículo a una velocidad final de 210 Km/h. Esta última fué adquirida por el museo en 2010 por una suma que ronda los 40 millones de dolares, si bien no se sabe a ciencia cierta el monto exacto ya que esta transacción llevada a cabo entre los herederos de Peter D. Williamson (anterior propietario) el museo citado y David Gooding como intermediario se hizo bajo la mas absoluta reserva, como es costumbre en este tipo de artículos. When we talk about Fast Back body type, imagination goes to the popular Mustang and surely, if we think of the past, we can point to the body of GM Sedanette type. They also are ways that had nothing to do with its European background and its name, more artistic, body “Drop of Water”. French origin of course. One of its outstanding representatives is the Bugatti Type 57 S Atlantic, which was based on the Coupe Aerolithe Elektron a show car built for the Paris Salon of 1935, which as it was built with panels Elektron (magnesium alloy and aluminum) became very difficult to weld. 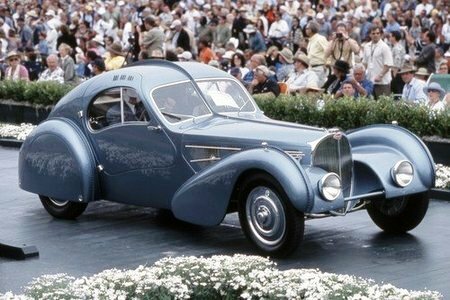 This was how Ettore Bugatti used to carry out the design of his son Jean, the characteristic welt seams, linking the body into two halves. This union was to be done externally. While the other three units were built in aluminum, these welt seams were retained as they gave their characteristic way that made her famous. Only 4 units of this model were built. Equipped with an engine of 8 cylinders in line double camshaft at the head, 3.3 liters and 210 hp circulating achieving the 960 kg weight of the vehicle to a top speed of 210 km / h.
The latter was acquired by the museum in 2010 for an amount of around 40 million dollars, although no one knows for sure the exact amount as this transaction carried out between the heirs of Peter D. Williamson (former owner) the museum and David Gooding as an intermediary was done under the strictest confidence, as is customary in these types of items.